Sometimes taking care of your most basic body fluid can be a real balancing act. Toilets across Asia — and I’ve been told also in many areas of Europe — are often the squat type, meaning the toilet is a flat porcelain basic set in to the ground over which you squat down to pee. To tell you the truth, I think this toilet style is genius because you don’t have to touch anything; no dirty toilet seats covered with urine, no hovering precariously over a toilet bowl you really don’t want to touch. With these squat toilets you don’t even have to press a flusher because usually there is a foot pedal to get the water going. 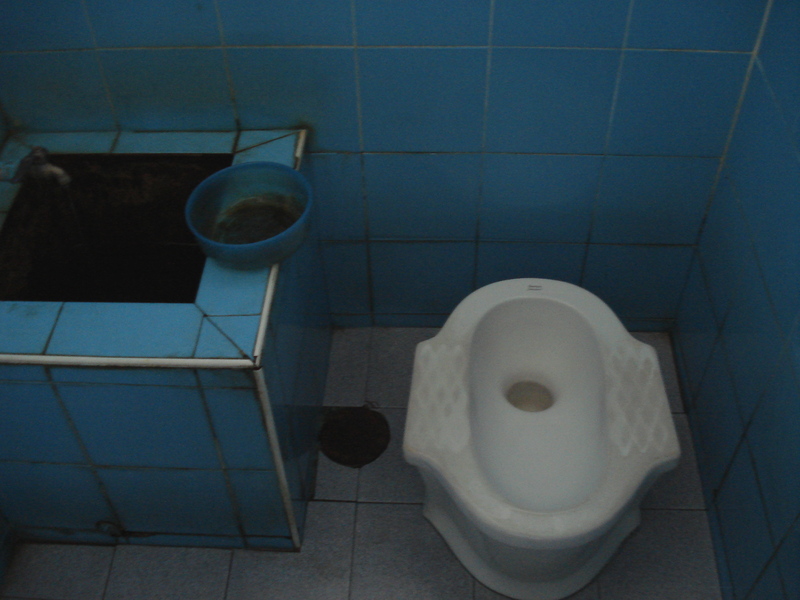 I can see why many Asian countries think the western style toilet is gross… there is way too much contact. 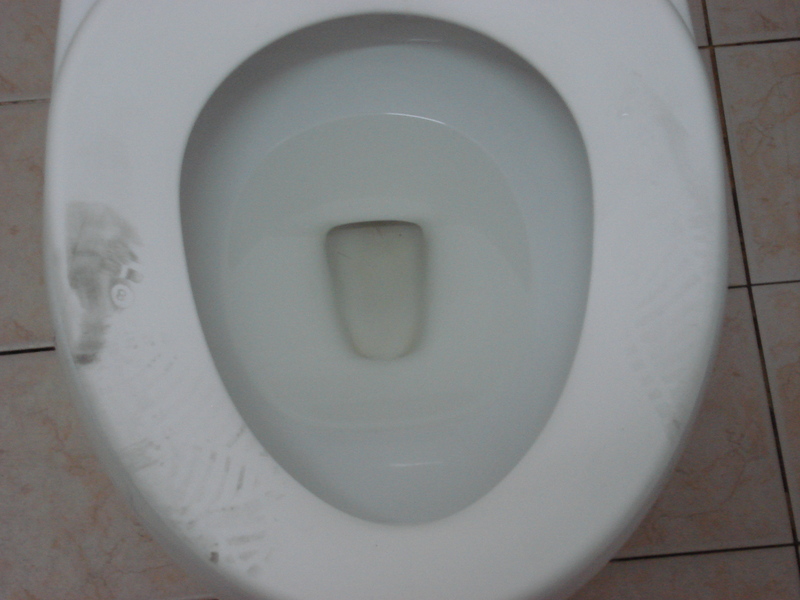 A common sight on Western toilets in Asia — shoeprints from someone who actually squatted on top of the toilet seat! Thai toilets, however, are quite different to those I’ve seen in other places in Asia, like Japan, China and Malaysia. Thai toilets are still squats, but they are elevated, which means that if you are a comparatively huge foreigner person, you have to balance yourself quite carefully on the steps in order to squat down. Thai people in general are pretty small — small frames, short stature — and in comparison my big bones and 30-year-old baby fat make me quite a big girl. I’m sure it’s pretty easy for a little Thai person to balance on these toilets, but for me, wow is it a challenge. Especially if drunk!! Another thing that is quite common here, both in Bangkok and in Koh Samui, is that many places ask you not to flush the toilet paper down the toilet. 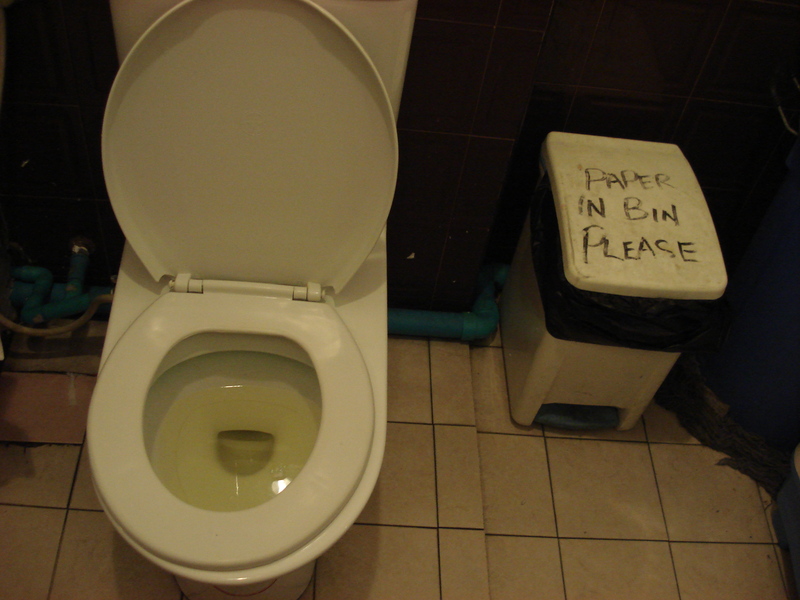 Many restaurants and bars will have a huge plastic bin next to the toilet for you to put your used toilet paper because their plumbing is not good enough to handle millions of flushes of toilet paper. That is if you can even GET toilet paper! Over the year I have learned to always, and I mean ALWAYS, walk with toilet paper because it is not a guarantee. If we are out in a night market or a street bazaar, I always steal some napkins or tissues and stow them in my handbag. Traditionally the Asian style was to use a hose to wash your derrier but this is something I dare not even try. I wouldn’t even know how to if I tried and would probably end up soaking my clothes! So take a tip from me: steal napkins everywhere you go… you never know when they will come in handy. Thus ends my insight into various Asian style toilets. Class dismissed! YOu might find these squat toilets in France too. They do still exist. Stands back from the keybraod in amazement! Thanks! So I’ve heard! But not in England at all? The rule in Morocco is also BYOTP. Traditional Moroccan toilets are also the “squat over a hole” type, but no flushing. There is usually a bucket and a water spigot in the room with the toilet, and I, too, dare not try it. But there is often no receptacle for the used paper! Jen — what are you supposed to do with the used TP! ?